Standing quite in contrast to the false ecumenism of the counterfeit church of conciliarism, which is one of its fundamental "counter-marks," if you will, of its apostate nature, is the genuine apostolic zeal for the conversion of those steeped in the heresies and errors of Protestantism that was displayed by the great saint we commemorate today, Saint Fidelis of Sigmaringen, who was put to death this day by those wretched creatures called Calvinists in the year 1622. 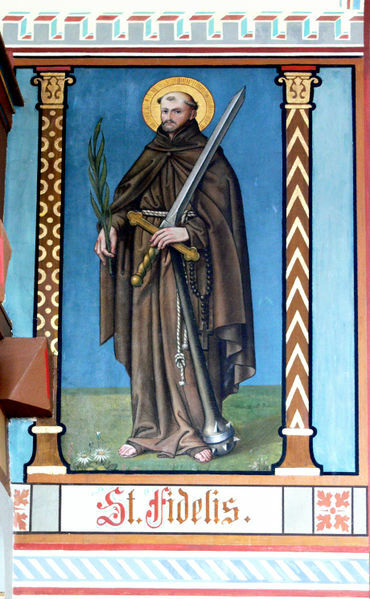 Saint Fidelis was a member of the Capuchin branch of the Order of Friars Minor. As a true son of Saint Francis of Assisi, who sought the conversion of the Muslims (see Frank Rega's Saint Francis of the Assisi and the Conversion of the Muslims, published by TAN Books and Publishers), Saint Fidelis was zealous for the salvation of the souls of those whose immediate ancestors had defected from the Faith and unleashed a bloody reign of terror against those who adhered to the true Faith that Our Blessed Lord and Saviour Jesus Christ entrusted exclusively to the teaching authority and the sanctifying offices of the true Church that He Himself founded upon the Rock of Peter, the Pope. Our Risen Lord would have around him a bright phalanx of martyrs. Its privileged members belong to the different centuries of the Church's existence. Its ranks open to-day to give welcome to a brave combatant, who won his palm, not in a contest with paganism, as those did whose feasts we have thus far kept, but in defending his mother, the Church, against her own rebellious children. They were heretics that slew this day's martyr, and the century that was honoured with this triumph as the seventeenth. Fidelis was worthy of his beautiful name. Neither difficulty nor menace could make him fail in his duty. During his whole life, he had but the glory and service of his divine Lord in view: and when the time came for him to face the fatal danger, he did so, calmly but fearlessly, as behooved a disciple of that Jesus who went forth to meet his enemies. Honour, then, be to-day to the brave son of St. Francis ! truly he is worthy of his seraphic Patriarch, who confronted the Saracens, was a martyr in desire ! Protestantism was established and rooted by the shedding of torrents of blood; and yet Protestants count it as a great crime that, here and there, the children of the true Church made an armed resistance against them. The heresy of the sixteenth century was the cruel and untiring persecutor of men, whose only crime was their adhesion to the old faith--the faith that had civilized the world. The so-called Reformation proclaimed liberty in matters of religion, and massacred Catholics who exercised this liberty, and prayed and believed as their ancestors had done for long ages before Luther and Calvin were born. A Catholic who gives heretics credit for sincerity when they talk about religious toleration proves the he knows nothing about the past or the present. There is a fatal instinct in error, which leads it to hate the Truth; and the true Church, by its unchangeableness, is a perpetual reproach to them that refuse to be her children. Heresy starts with an attempt to annihilate them that remain faithful; when it has grown tired of open persecution it vents its spleen in insults and calumnies; and when these do not produce the desired effect, hypocrisy comes in with its assurances of friendly forbearance. The history of Protestant Europe, during the last three centuries, confirms these statements; it also justifies us in honouring those courageous servants of God who, during that same period, have died for the ancient faith. Let us now respectfully listen to the account given us, in the Liturgy, of the life and martyrdom of St. Fidelis; we shall find that the Church has not grown degenerate in her Saints. Fidelis was born at Sigmaringen, a town of Swabia. His parents, whose name was Rey, were of a respectable family. He was remarkable, even when a child, for his extraordinary gifts both of nature and grace. Blessed with a talent of a high order, and trained to virtue by an excellent education, he received at Freiburg the well-merited honours of Doctor in Philosophy and in Civil and Canon Law, at the same time that, in the school of Christ, he strove to attain to the height of perfection by the assiduous practice of all virtues. Being requested to accompany several noblemen in their travels through various countries of Europe, he lost no opportunity of encouraging them, both by word and example, to lead a life of Christian piety. In these travels, he moreover mortified the desires of the flesh by frequent austerities; and such was the mastery he gained over himself, that in the midst of all the troubles and excitement, he was never seen to lose his temper in the slightest degree. He was a strenuous upholder of law and justice, and, after his return to Germany, he acquired considerable reputation as an advocate. But finding that this profession was replete with danger, he resolved to enter on the path that would best lead him to eternal salvation. Then enlightened by the divine call, he shortly afterwards asked to be admitted into the Seraphic Order, among the Capuchin Friars. His pious wish being granted, he showed from the very commencement of his novitiate how thoroughly he despised the world and himself; and when, with spiritual joy, he had offered to God the vows of solemn profession, his regular observance was such as to make him the admiration of, and a model to, all around him. He devoted himself to prayer and to sacred studies; as also to preaching, for which he had a special grace, and by which he not only converted Catholics from a life of wickedness to one of virtue, but also drew heretics to knowledge of the truth. He was appointed superior as several convents of his Order, and fulfilled his office with admirable prudence, justice, meekness, discretion and humility. His zeal for strict poverty was so great, that he would allow nothing to be in the convent which was not absolutely necessary. He practised severe fasting, watching and disciplines, out of holy hatred against himself; whereas his love towards others was that of a mother for her children. A contagious fever having broken out among the Austrian soldiers, causing frightful mortality, he devoted his whole energies to untiring acts of charity in favour of the sick, whose sufferings were extreme. So admirable was he, both in advice and action, in settling disputes, and relieving everyone in trouble or trial, that he won for himself the name of the Father of his country. From the beginning of his apostolic career he was untiring in his efforts to convert heretics nor did he confine his efforts in this direction to the pulpit, but also used his pen. He wrote many pamphlets against Calvinism and Zwinglianism though he would never put his name to his writings. Unfortunately these publications have long been lost. Fidelis was still guardian of the community at Feldkirch when in 1621 he was appointed to undertake a mission in the country of the Grisons with the purpose of bringing back that district to the Catholic Faith. The people there had almost all gone over to Calvinism, owing partly to the ignorance of the priests and their lack of zeal. In 1614 the Bishop of Coire had requested the Capuchins to undertake missions amongst the heretics in his diocese, but it was not until 1621 that the general of the order was able to send friars there. In that year Father Ignatius of sergamo was commissioned with several other friars to place himself at the disposal of this bishop for missionary work, and a similar commission was given to Fidelis who however still remained guardian of Feldkirche. Before setting out on this mission Fidelis was appointed by authority of the papal nuncio to reform the Benedictine monastery at Pfafers. He entered upon his new labours in the true apostolic spirit. Since he first entered the order he had constantly prayed, as he confided to a fellow-friar, for two favours: one, that he might never fall into mortal sin; the other, that he might die for the Faith. In this Spirit he now set out, ready to give his life in preaching the Faith. He took with him his crucifix, Bible, Breviary, and the book of the rule of his order; for the rest, he went in absolute poverty, trusting to Divine Providence for his daily sustenance. He arrived in Mayenfeld in time for Advent and began at once preaching and catechizing; often preaching in several places the same day. His coming aroused strong opposition and he was frequently threatened and insulted. He not only preached in the Catholic churches and in the public streets, but occasionally in the conventicles of the heretics. At Zizers one of the principal centres of his activity, he held conferences with the magistrates and chief townsmen, often far into the night. They resulted in the conversion of Rudolph de Salis, the most influential man in the town, whose public recantation was followed by many conversions. "I came to extirpate heresy, not to embrace it." Ah, what a contrast between Saint Fidelis of Sigmaringen and the faithless ones of the counterfeit church of conciliarism who embrace heresy and the false religions of idolaters and who do not seek to extirpate these things. "God bless the Methodists, "God bless the Baptists, "...on the sacred Mount Hiei." These are the sorts of words that issued from the mouth of Joseph Ratzinger/Benedict XVI, not the fidelity of the faithful Saint Fidelis of Sigmaringen. Saint Fidelis's martyrdom came some eighteen and one-half months before that of Saint Josaphat Kuncevyc on November 12, 1683, at the hands of the Orthodox whose conversion he had been seeking with great urgency. Saint Fidelis's zeal for the conversion of the Protestants came within a very short time after the apostolic work of Saint Peter Canisius, S.J., whose feast we commemorate today, April 24, 2013, on the Octave of the Solemnity of Saint Joseph, and more or less contemporaneously with that of Saint Francis de Sales, who was his senior by seven years and who died just one year before his own martyrdom. Both Saint Peter Canisius and Saint Francis de Sales sought to convert the Calvinists. Their work bore much fruit. Over 60,000 Calvinists returned to the true Faith at the preaching of Saint Francis de Sales. There is a fatal instinct in error, which leads it to hate the Truth; and the true Church, by its unchangeableness, is a perpetual reproach to them that refuse to be her children. Catholics seek the conversion of non-Catholics, being willing to give up their lives to do so. This is not the spirit of the faithless ones who populate the levers of power in the counterfeit church of conciliarism.